Practical, not theatrical, the Holdman Glass Studios—part of the Art Institute at Thanksgiving Point—takes a taciturn back seat to attractions of the park. But it’s a formidable force in the international community of stained-glass production. 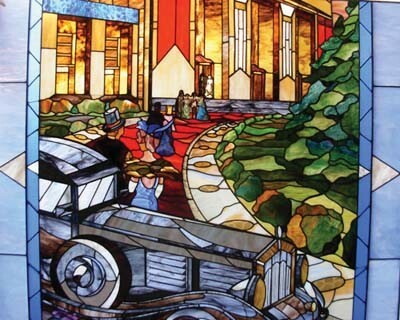 As a young returned LDS missionary, Holdman landed his first major commission from the Orem Public Library—a monumental window that clued many into what this unprepossessing artist was capable of. Subsequently, and with little formal training, he has beautified LDS temples in Palmyra, N.Y.; Nauvoo, Ill.; Sao Paulo, Brazil; and New York City, among others. Community centers, private homes and museums also feature his work, which can run a buyer hundreds of thousands of dollars. A current project in its nascent stages is an 80-panel series for Utah Valley University titled “History of the World”—abridged, yes, but this project promises to explore the subject in glass. It is understandable that when Holdman—son of an artist and raised in an environment where being an artist was actually encouraged—took a stained-glass course in the ninth grade, he foresaw his future. With zeal and talent, he is living that vision, and is today ranked with the best in stained-glass making. Holdman’s studio represents a lifetime of experience, learning and passion with no trace of waning. “I am always trying new things, new methods in art glass, trying to see how far I can push the medium,” he said. Holdman and 11 apprentices work painstakingly at producing exquisite stained glass as well as unique bowls, vases and abstract glass art that all bear the hallmark traits of Holdman’s work. This humble artist is mentor, teacher and master of his art to his apprentices through an educational, symbiotic relationship. Holdman aims at “providing an experience of what it is like in the art world. To be a good artist means believing you can do it,” he says. Holdman hopes to continue an artistic legacy begun by his father that he in turn can pass on. 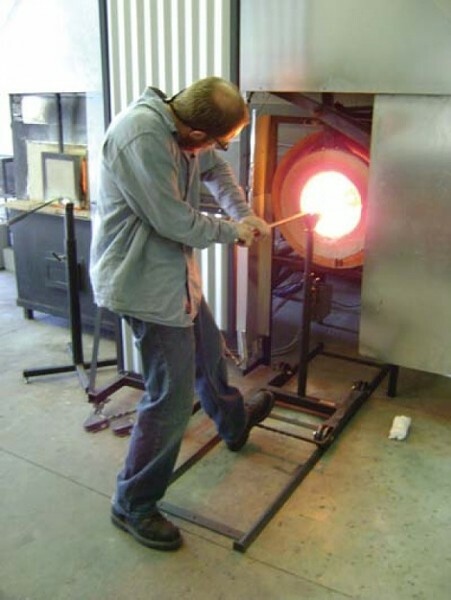 The Holdman Studio invites the public to become involved in glassmaking. The act of working with the medium of glass, an almost organic process, has an appeal for those interested in aesthetics and also the most “left brained” individual. Engaging the public in the process of the creation of glass art, to experience and become educated in it, is a part of the Studio’s mission. Instead of buying roses this Mother’s Day, let an expert guide you in “pulling a flower.” You choose the colors, you mold the shape and Mom will have something beautiful and lasting. Other opportunities to get involved with include a four-hour glassblowing class, stained-glass course and free tours offered to various groups. Torlina hopes that the community will participate in learning, creating and experiencing this dynamic art form.